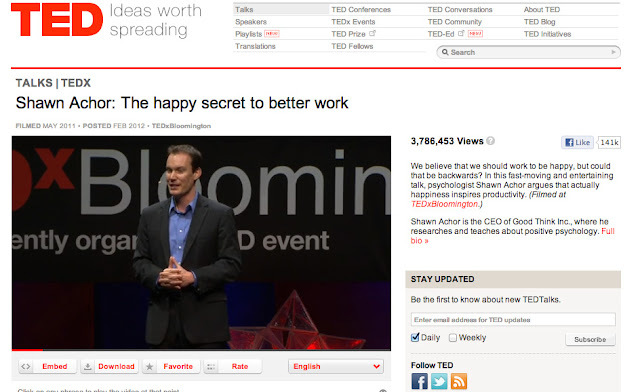 Shawn Achor's talk on TED is titled: The Happy Secret to Better Work is an inspiring and thought provoking one (and funny too). If you have not watched it yet, click here to watch. In this talk the main theme is: We believe that we should work to be happy, but could that be backwards? In this fast-moving and entertaining talk, psychologist Shawn Achor argues that actually happiness inspires productivity. Shawn is an expert on Positive Psychology and based on his research and 12 years of experience at Harvard, in this talk he describes how to increase happiness and meaning, raise success rates and profitability, and create positive transformations that ripple into more successful cultures. Though Shawn's talk address about happiness at work, by extension this is applicable even more importantly in all aspects of life, specially the aspect of being in every state of our lives. "… they say, "Shawn, why do you waste your time studying happiness at Harvard? Seriously, what does a Harvard student possibly have to be unhappy about?" Embedded within that question is the key to understanding the science of happiness. Because what that question assumes is that our external world is predictive of our happiness levels, when in reality, if I know everything about your external world, I can only predict 10 percent of your long-term happiness. 90 percent of your long-term happiness is predicted not by the external world, but by the way your brain processes the world. And if we change it, if we change our formula for happiness and success, what we can do is change the way that we can then affect reality. What we found is that only 25 percent of job successes are predicted by I.Q. 75 percent of job successes are predicted by your optimism levels, your social support and your ability to see stress as a challenge instead of as a threat. … The absence of disease is not health. Here's how we get to health: We need to reverse the formula for happiness and success. In the last three years, I've traveled to 45 different countries, working with schools and companies in the midst of an economic downturn. And what I found is that most companies and schools follow a formula for success, which is this: If I work harder, I'll be more successful. And if I'm more successful, then I'll be happier. That undergirds most of our parenting styles, our managing styles, the way that we motivate our behavior. Now if you already watched the talk (if not, here is another chance) and also after re-reading his main points, if you observed carefully, you might already see that what Shawn has discovered through his experience and research is something which is naturally embedded in spiritual tradition. The only difference is, everything else has advanced significantly, but spiritual traditions and its organic wisdoms are hardly ever presented to the world in a fashion that may attract appreciation by the modern 21st century scientifically oriented minds. What I immediately noticed on Shawn's talk and my very rudimentary understanding of the Islamic as well as other religious traditions that almost all has mechanisms and system to tap on to the Happiness Advantage, that taps on to the Gratitude and doing good to others as something very fundamental spiritual action and states. Now if we look at spiritual traditions, and as case study if we take Islamic practices, we can easily come to appreciate how the heart, mind and brain is always oriented towards positivity, towards hopefulness and towards positive processing. If you can raise somebody's level of positivity in the present, then their brain experiences what we now call a happiness advantage, which is your brain at positive performs significantly better than it does at negative, neutral or stressed. Your intelligence rises, your creativity rises, your energy levels rise. In fact, what we've found is that every single business outcome improves. Spiritual tradition has always been speaking about not only focusing on the present but also being positive in the moment. The regular practice of prayer is one such tremendous powerful tool that encompass a lot of wisdom, some of which is now starting to reveal to humanity, but surely many more to be discovered as days progress. 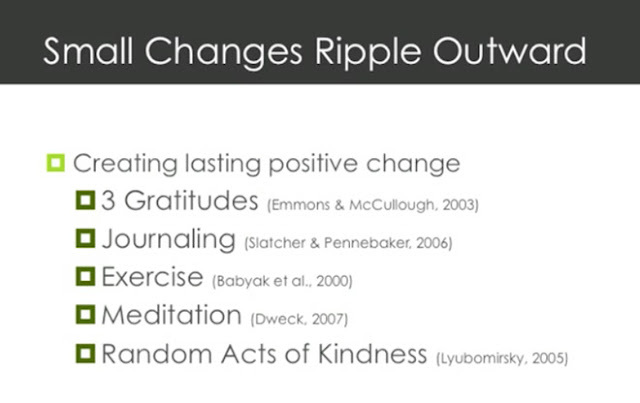 If you look at this presentation from Shawn's talk you will see Gratitude tops the list. Then journaling, followed by exercise, meditation and act of kindness. If we again go back to Islamic tradition (and mind you, every single spiritual tradition have them embedded, whether we can identify them or not) we can see how these are all present. The regular prayer practice of Islam, known as Salaat beings by expressing gratitude, reminding ourselves about reasons to be grateful and this is repeated many times through out the day and night. What is suggested in the above as journaling is the practice of first becoming mindful of life, finding purpose in life, witnessing our daily activities. On the very basic level this is achieve through supplication or dua which is not exactly prayer in Christian term, but rather conversation from the person to the Lord and this is private conversation, a vocal journaling. Also in practice of muhaseban nafs (from the word hasib, reckoning, taking account), taking account of the self and its activities, this is done in deeper level. Even within salaat as we move from one bodily station to another, from standing, to bowing, to sitting and to prostrating, even there are micro practices of mindfulness. For example when we prostrate on the ground, we focus on the tip of the nose, the station of breathe and by resting our eyes on the tip, we practice single mindedness as we exalt the Lord by saying, Glory be to the Highest Lord. The step exercise refers to active life. Meditation is again directly from spiritual traditions. Every single prayer can be meditation, and purposefully at the end of each salaat if someone spend a little time on the meditation "Allahu Hazir, Allahu Nazir, Allah Maiyee" - Allah is Present, Allah is Seeing Me and Allah is with Me - this is powerful enough to help God Consciousness (Taqwa) to dawn on the self. Finally what Shawn mentioned towards happiness is random acts of kindness and this is best inspired and motivated by when this is done with love. And spiritual traditions have always encouraged this. So in summary, what positive psychologists are saying today, have been part of humanity's ancient wisdom traditions, whether we have intellectually analyzed them before or not. The benefit is out there to harvest. When it comes to practicing religion and embodying spirituality, we often think of many different reasons such as attaining Paradise, receiving Christ, finding God, to receive rewards etc. But what is overlooked is that every religious and spiritual tradition is also inherently interested to produce happy human being. We often forget that Happiness is one of the most fundamental goal of spirituality. If our religious practices and spirituality does not create a positive human being, a happy person, a fully content being - then we have not understood religion at all. If saying so many times, "Alhamdu lillahi rabbi-l Aalameen" - "All praise is to the Lord of the Worlds" - does not produce gratitude within us to the extent that we can always be seeing gifts, always content and happy - then we have not really said it even a single time with the attention it deserves. May God make us all happy in true sense, may His joy and bliss permeate our life in this world and in the next. Ameen. Jesus the son of Mary said: "O Allah, our Lord! Please send down to us nourishment from heaven which should be to us an ever-recurring happiness, for the first and the last of us - a festival and a sign from You; and provide us sustenance, for You are the Best of Providers."